Majin Tantei Nougami Neuro Wallpaper: Don't feed the slave! Minitokyo »	Majin Tantei Nougami Neuro Wallpapers » Majin Tantei Nougami Neuro Wallpaper: Don't feed the slave! This was my entry for the Which?Waller guessing game over at The Planning Board. It was my first time participating and I really wish I could've made a prettier wall. I think this wall is somehow awkward and the culprit is Neuro! He just looks kind of weird here and though I really love the manga I don't think the art is that outstanding to begin with (the story does make up for it in my opinion though). So blame it on me or the original art that this wall fails, I'll try to make up for it by making a pretty Neuro wall someday. 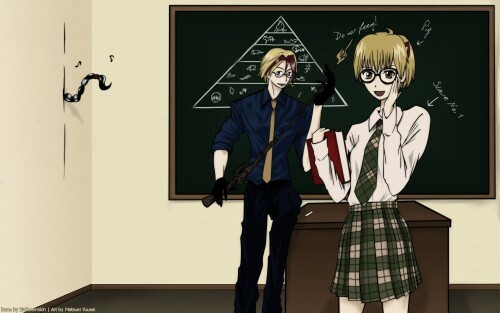 Akane was vectored of some random image and the pyramid on the chalk board was a really random image that popped up in the manga once, I thought it was hilarious and had to be included, the writing seemed just like something Neuro would actually do that's why I added it. Textures and patterns were taken from Hybrid Genesis and Dioma@Deviantart. I won't add further resolutions unless someone asks for them and don't take that pointer personally, Neuro always points with his middle finger (I wish I were kidding). The vectoring is perfect (as usual), though I'm not too hot with the actual art style. whoas what's that thing in the wall >:O! Interesting wallpaper. First, I have to ask, what in the world is that ponytail coming out of the wall? :o The way the characters are drawn kind of resemble Hayate the Combat Butler drawing style (well in this wallpaper). Which is a plus for me. :) I like the changes you made too. I like the wallpaper (the ponytail still freaks me out though...). Overall, nice work! Hahaha, interesting work! Thanx for sharing, dear!